The final part of this series of blog posts will present some open source software that you can use to exploit the new memory space. You can download the library source code from my downloads page. I’ve put together a collection of functions into a library that you can use to manage access to the extended memory. The aim of the library is to enable the existing memory allocation functions such as malloc, free, new and delete to work with the extended memory. Download the library zip file from my downloads page. Browse to the libraries subdirectory of your Arduino installation. For example, for me that would be C:\Program Files (x86)\arduino-1.0.1\libraries. Unzip the download into that directory. It should create a new folder called xmem with two files in it. This function must be called before you do anything with the extended memory. It sets up the AVR registers for external memory access and selects bank zero as the current bank. If you set the heapInXmem_ parameter to true (recommended) then the heap used by malloc et. al. will be located in external memory should you use it. Use this function to switch to another memory bank. bank_ must be a number between zero and seven. If switchHeap_ is true (the default) then the current state of the heap is saved before the bank is switched and the saved state of the new bank is made active. This heap management means that you can freely switch between banks calling malloc et. al. to make optimum use of the external memory. This is a diagnostic function that can be used to check that the hardware is functioning correctly. It will write a bit pattern to every byte in every bank and will then read back those bytes to ensure that all is OK. Because it overwrites the entire external memory space you do not want to call it during normal program operation. This function returns a structure that contains the results of the self test. The structure is defined as follows. If the self-test succeeded then succeeded is set to true. If it fails it is set to false and the failed memory location is stored in failedAddress together with the failed bank number in failedBank. In this section I’ll outline some common scenarios and how you can configure the external memory to achieve them. 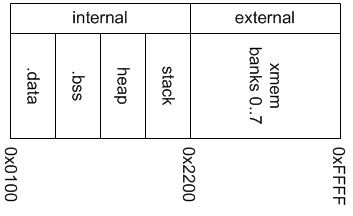 In this scenario the malloc heap and global data remain in internal memory and you take direct control over the external memory by declaring pointers into it. Your code could declare pointers into the external memory and use them directly. This is the simplest scenario. In this scenario we move the malloc heap into external memory. Furthermore we maintain separate heap states when switching banks so you effectively have eight independent 56Kb heaps that you can play with. This is a powerful scenario that opens up the possibility of using memory-hungry libraries such as the STL that I ported to the Arduino. Example 1, using c-style malloc and free to store data in the external memory. Example 2. Using the standard template library to store some vectors in external memory. This is the slowest option but undoubtedly the most flexible. vectors only scratch the surface of what’s possible. maps and sets are all perfectly feasible with all this memory available. Hi, thanks for putting together xmem. Any idea how one could go about creating a struct in external memory (quadram in this case) with xmem? The value printed should be between 0x2200 and 0xFFFF. We are using the freeMemory() library to monitor the internal memory; when we active xmem::begin(true) freeMemory() begins giving unreliable readings? Can you help … it is useful to know what the internal available memory is? Really glad you put this together for us. I only need a maximum of 2KBytes external space, but it has been a real big help in my project. I plan to use your library for many future projects as well. I just can’t believe how incredible the Arduino Mega has turned out to be. I’m glad I could help. Good luck with your projects. I was looking for an example of adding external memory and found your page which looks good. I havent fiddled with it yet since I need to purchase some memory first. Since I dont want to throw away a lot of memory (the botton 8KB) – I plan to only use the upper 32-64KB memory area – and then add another page select signal connected to the SRAM A15. The pages will only be 32KB but twice as many. I understand your goal but not how you’re going to achieve it. 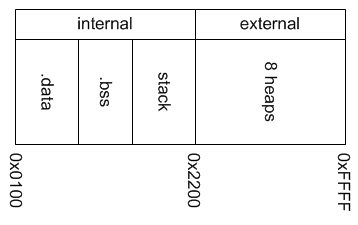 What size SRAM are you planning to use and, referring to section 9.1 of the ATMega1280 datasheet, which addressing scheme will allow you to access the lower 8Kb of your external memory? Hi Andy. Thanks for responding. Since I have only just started looking at external memory yesterday I wasnt aware that 0x9100 to 0xFFFF was “Do not use”. I thought the Xmem was available from 0x2200 to 0xFFFF in one regular continuous block seen from the software. Thanks for pointing this out to me. I suppose one has to use a GAL/PAL circuit or some 74HC logic to make it happen without losing something? Andy: I now have one of your memory cards running on my Mega. Seems to work well. I will be using it to store very large 2 dimensional array. I don’t see any issues with that. I would like to know how to check to see how much memory is used and how much is left. Should I initialize the memory with say 0xff in each mem location at boot time and before using the RAM?? I thought about initialize that RAM with 0x00 or 0xff and count them remaining ones but that won’t work as most of the data I will be storing will be XBM graphic files an very likely could have lots of 0x00s and 0xffs. The simplest method would be to place the heap in the external memory and use malloc/free to perform the usage management. Thanks for your input. I will take that into consideration.